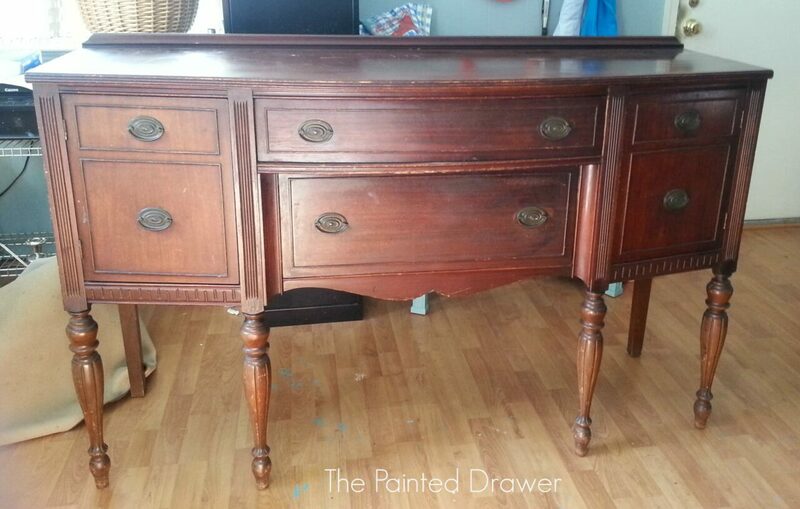 Here is the “before” of the gorgeous vintage sideboard that I just finished for a client. She decided to go with black (a little out of the box for me) and so, with trepidation, I opened my new tin of General Finishes Lamp Black. I have to admit – I love, love, love the black! It makes the piece look sharp and modern and the matte finish complements the age of the piece. What a transformation! I changed out the old pulls for some pretty glass ones to add sparkle against the black backdrop. 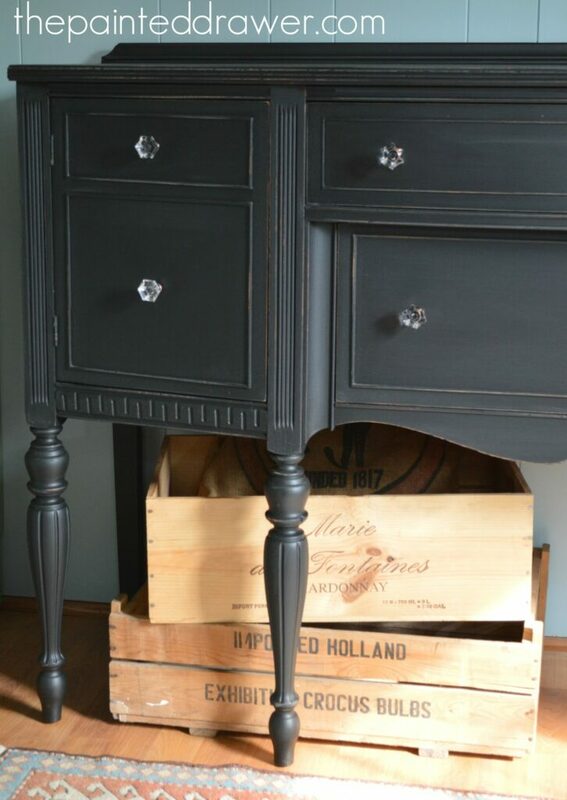 The piece was only lightly distressed, just enough for the details to pop out against the dark finish. 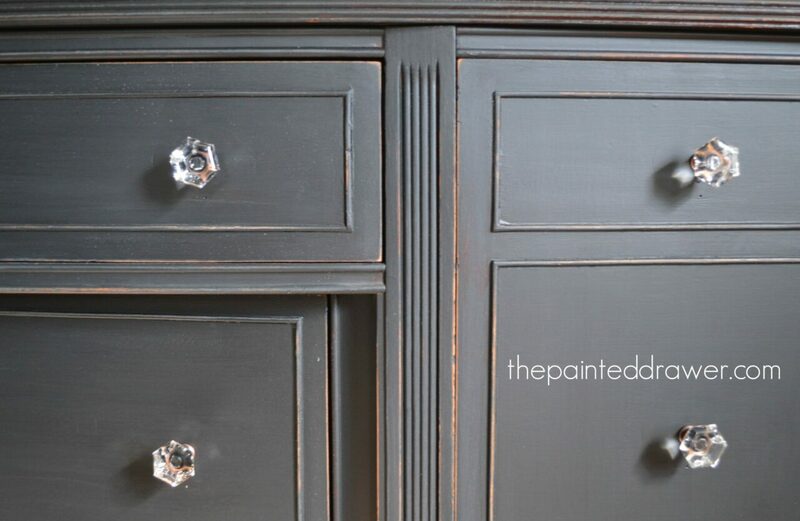 The Midnight Sideboard! That looks great Suzanne-great job and the color is stunning! Love, love, love the black! You might be hooked now! Ha! And the legs…oh my goodness…gorgeous! Gorgeous Suzanne! 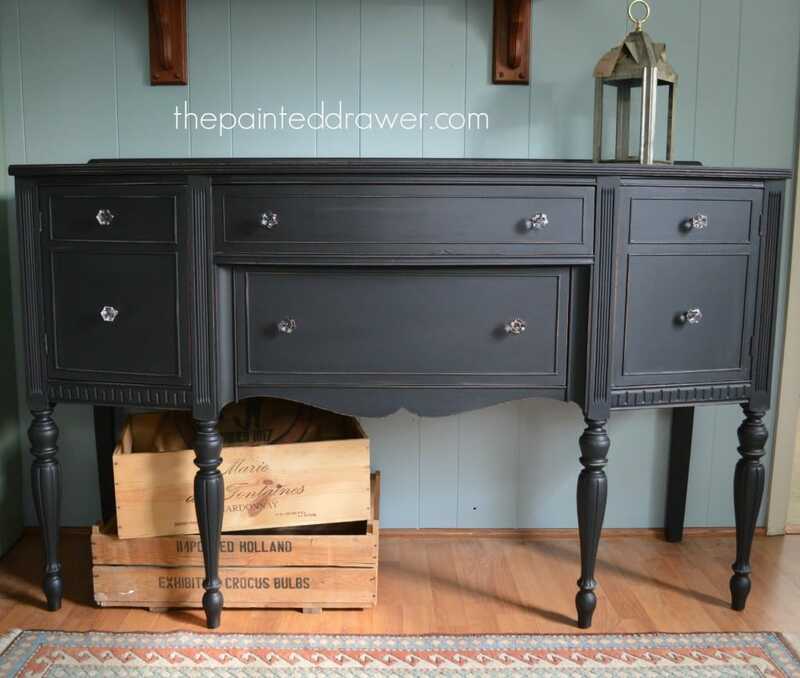 I have my GF Lamp Black waiting for the perfect project… this beautiful piece inspires me! I love that color! Georgeous! Oh, my…what a wonderful piece of furniture!! That paint color is beyond beautiful. 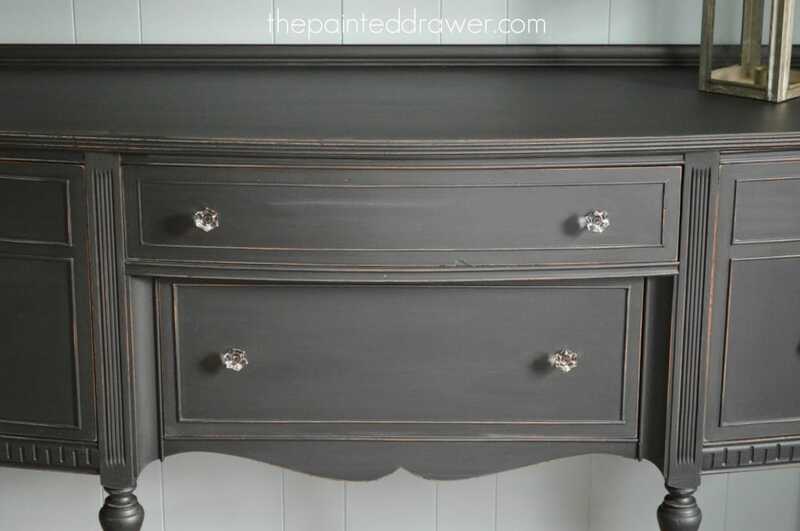 I have a cabinet that isn’t really old but have been wanting to paint it and I think now that this color would be just perfect. I have a small round side table, as well. The only thing is that I need to add some wood filler to some spots on top. Will that paint cover that well? or would I need to use a primer first? Where do I purchase this paint? You have been so gracious to help me in the past and I thank you for that!! black look that is so popular. 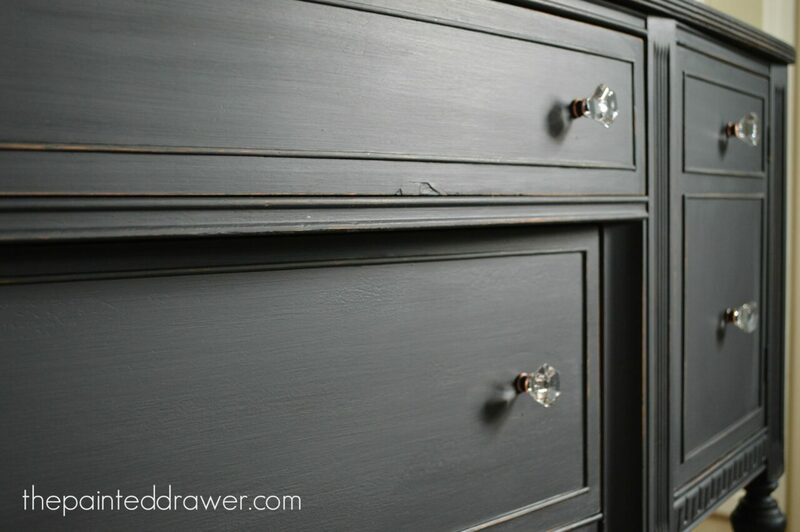 Good idea to use the glass knobs as I used new hardware pulls that look equally as nice. Nice to know that there is a twin out there to my piece. beautiful!!!! 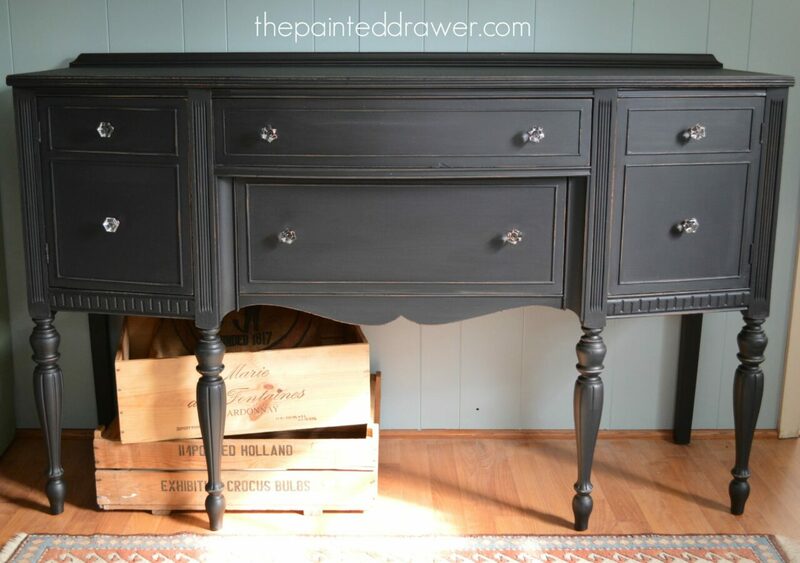 i love lamp black on this piece! Perfect! Lamp Black is one of my go-to colors. What finish did you use? Lovely! What kind of a topcoat did you use? Thanks, I really like the pieces you do with General Finishes. Hi Carol, I use their high performance water based topcoat in the flat finish. It is applied easily with a sponge brush and dries quickly. I like that the finish isn’t shiny so it looks great on my distressed pieces. Thanks! Love it! Guess what? 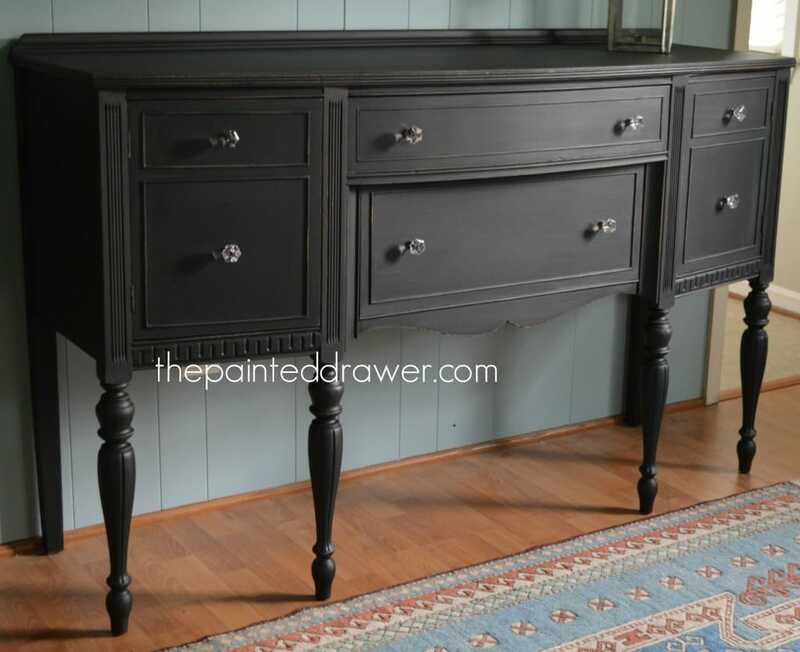 I have another dresser, chest of drawers and end stand that all match the piece you’ve done with some minor differences. Getting ready to paint all three…in black!